Ginanjar Anggit Prasetyo or usually called Anggit by his friends, born October 13th 1999 in Wonosobo, Central Java is a sophomore of English Language Education Department at Universitas Muhammdiyah Yogyakarta. When earthquake hit Lombok and many people became the victim of the disaster, his heart was moved to do something for the cause. 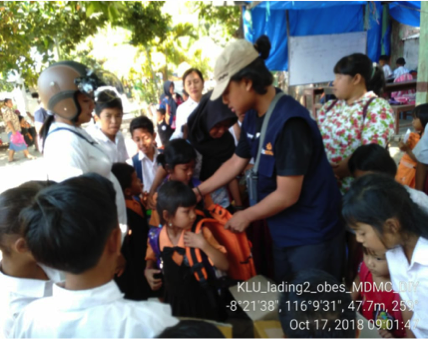 Therefore, when MDMC (Muhammadiyah Disaster Management Center) Yogyakarta called for volunteers to be sent to the island, he grabbed the opportunity. He ventured to register through the interview test. Being a member of MAPALA UMY (Mahasiswa Pecinta Alam) who has been armed with survival skills, he passed the the test and was sent to Lombok. From October 1st to 30th 2018, with 39 other people from several regions in Yogyakarta which whom only 3 are from UMY, he did volunteering work for MDMC. He and some other volunteers was responsible to entertain children, so that they could help them recovering from the mental trauma that they faced throughout the disaster. He was later also assigned to help out with the logistic team as more people were needed. 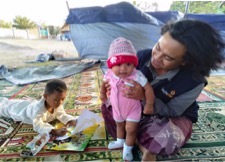 “In my heart when I saw the disaster in Lombok, I wanted to help with money, However, I realized I did not have one. I think sending merely prayer for them was not enough, so I just decided that I needed to go there to help out in the field,” Anggit replied. He also believes that if we can always be at the front guard in helping people who are in calamity, later we will also be helped if they are in trouble or calamity either by other people or Allah SWT.